COVERS FOR CAGE - Trolleys on dog show. Vous devez avoir une protection parfaite pour vos chiens - de la pluie, le soleil et les insectes. Eh bien, vous avez trouvé! Nous avons les couvertures de haute qualité pour la cage! Ce est ce que vous recherchez! You must have a perfect protection for your dogs - of rain, sun and insects. Well you have found! We have the highest quality covers for the cage! This is what you are looking for! Du måste ha ett perfekt skydd för din hund - regn, sol och insekter. Tja du har hittat! Vi har högsta kvalitet omslag för buren! Detta är vad du söker! Cover for the cage in any size. We recommend a very good quality covers on the cage. Made to order in any size. Currently available in the colors blue, azure, red, dark olive, black, clear green, pink, brown and clear purple, violet, orange. Cover for the cage in any size/two colours. Currently available in the colors blue, azure, red, pink, grey, clear green, dark olive, black, brown, clear purple, violet, orange. 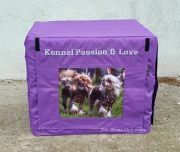 Cover cage with name of kennel and with photo of your dogs.